The Institute retained DPCI to enhance the Joomla! Web content management system and help realize the business goals it had for the organization's website. 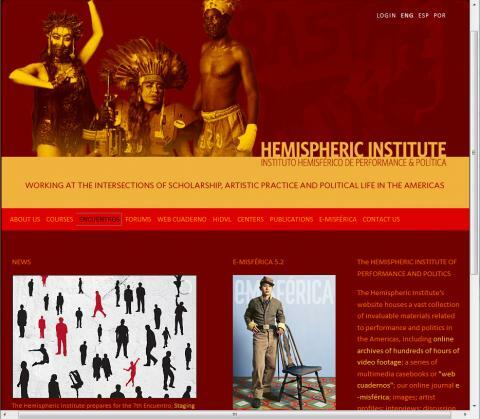 The Hemispheric Institute of Performance and Politics is a collaborative, multilingual, and interdisciplinary consortium of institutions, artists, scholars, and activists throughout the Americas. While its administration is housed at New York University, the Institute is comprised of over twenty-five member universities and cultural institutions throughout the Americas. After an initial attempt to implement the Joomla! platform, an open source Web content management system, management realized that it needed to more fully utilize the capabilities of that technology for the Institute's website. The Institute retained DPCI to enhance the Joomla! CMS Website and help realize the business goals it had for the organization's website. The initial Joomla! implementation only included a basic templating system. The site required additional configuration and template creation/refinement to meet the creative direction of the site and to support the three language offerings: English, Spanish and Portuguese. The site also required the capability to create new courses and provide authorized users with access to the course syllabus and similar private course information pages. In addition, the Encuentro Application database back-end required enhancements to meet growing administrative needs, including search capabilities and exporting of records into CSV and Microsoft Excel format. Following a restructuring and enhancement of the platform, the Institute now has the necessary Joomla! components installed, configured and available to support the multi-lingual community.